Welcome to the Spider-Girl Message Board, the home of Marvel's longest running female star! Created by the team of Tom DeFalco and Ron Frenz, May "Mayday" Parker is the daughter of Spider-Man and continues his legacy as Spider-Girl! Debuting in the final issue of "What If?!" in 1998 (mirroring her father's debut in the final issue of "Amazing Fantasy"), May burst upon the comics scene and immediately struck a chord with fans of classic Marvel storytelling. The Hoo-Ha action and storytelling in the Merry Marvel Manner reminded older fans of the books they had loved growing up, and introduced the classic style to a younger generation who had never experienced it before. The success of this introductory appearance launched not only an ongoing Spider-Girl series, but an entire new line and universe of comics. This new universe was called MC2 or Marvel Comics 2,and featured heroes and villains both new and old. While her sister titles faded away in time, the Spider-Girl series proper soldiered on. Despite the ongoing threat and occasional reality of cancellation, the caring and creative efforts of fans, largely started on this very board, helped keep the book alive. Against all odds, Spider-Girl achieved the milestone number of one hundred issues, and remains the longest running series with a female lead in Marvel Comic's history. The end of the original Spider-Girl title was in many ways a new beginning for the character, who soon returned in a new series titled The Amazing Spider-Girl in 2006. During the book's Amazing resurgence, we also saw several new MC2 mini-series, such as The Fantastic Five and American Dream (the latter of whom would even return post-MC2 in the Captain America Corps mini-series of 2011, proving the enduring popularity of the MC2 characters). 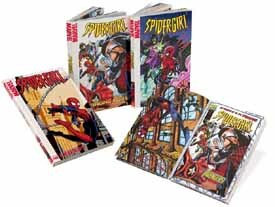 In 2009, after thirty issues, the Amazing Spider-Girl became The Spectacular Spider-Girl in back-up stories, and later a mini-series of the same name. In 2010, this most recent title ended, despite one more rally from her loyal fan base. Never in the history of comics has there been a more dedicated and driven group of fans, whose love of the Spider-Girl character would help carry her through more stories than even her creators had thought possible. 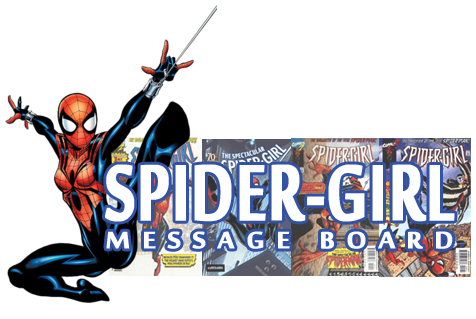 The continued presence of The Spider-Girl Message Board is not only due to the dedication we have to this character and her creators, but to the fans that, at least a little bit, helped out along the way. Don't miss this fantastic Spider-Girl music video created by our very own Jarkoer. Vol 1: Whatever Happened to the Daughter of Spider-Man? Vol 2: Comes the Carnage! Vol 1: Who Killed Gwen Reilly? And don't forget: Spider-Girl's earliest adventures have been collected in paperback digests. A mere $7.99 gets you at least six full-color issues. Available at comic shops, major bookselling chains and on-line booksellers, the Spider-Girl digests are handy, inexpensive and chock-full of high school angst and Hoo-Ha action! Buy a set for yourself and another for your favorite child. Collects issues 12-16 and the 1999 Annual. Collects issues 17-21 and 1/2. Collects issues 34-38 and 51. Art by Ron Frenz and Pat Olliffe, including original Spider-Girl pages, is available for purchase at Catskill Comics.